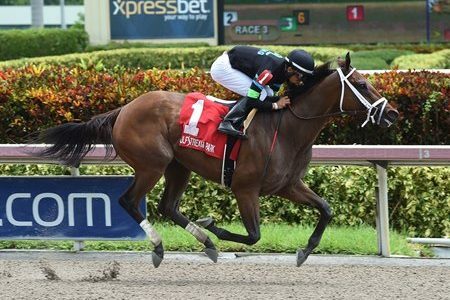 Alter Moon’s five-length victory in the $75,000 Azalea Stakes June 30 at Gulfstream Park gave Alternation his first stakes winner. JAL Racing’s 3-year-old filly stalked dueling leaders early in the seven-furlong dirt test under jockey Edgard Zayas, advanced alongside the pair entering the turn, hit the front midway through the bend, and pulled away without any challenge in the stretch. She finished the distance in 1:23.35. The Jose Velez-trained filly won an optional-claiming allowance by 14 3/4 lengths June 3 in her start prior to the Azalea. 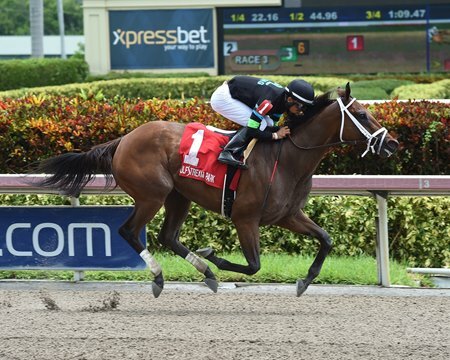 Her three previous stakes tries were all this season at Gulfstream—a sixth in the March 3 Davona Dale (G2), a fifth in the March 31 Gulfstream Park Oaks (G2), and a second in the April 21 Game Face Stakes. Alter Moon was bred in Kentucky by C. Hunter Hager and E. Claire Hager out of the Malibu Moon mare Sahara Moon, and was purchased by her current connections for $22,000 from S V G Thoroughbreds’ consignment to the Ocala Breeders’ Sales June 2017 2-Year-Olds and Horses of Racing Age Sale. S V G pinhooked the filly for $55,000 from Four Star Sales’ consignment to the Fasig-Tipton Kentucky Fall 2016 Yearling Sale. Alternation won nine races from 19 starts and four graded stakes—the 2011 Peter Pan (G2), and the Razorback Handicap (G3), Oaklawn Handicap (G2), and Pimlico Special (G3) in 2012. He earned $1,064,727 during his four seasons on the racetrack for trainer Donnie Von Hemel. The son of Distorted Humor raced for breeder Pin Oak Stud and now stands at Pin Oak, where his 2018 fee was advertised as $6,000.